It's time for another installment of "Seavers in the News." 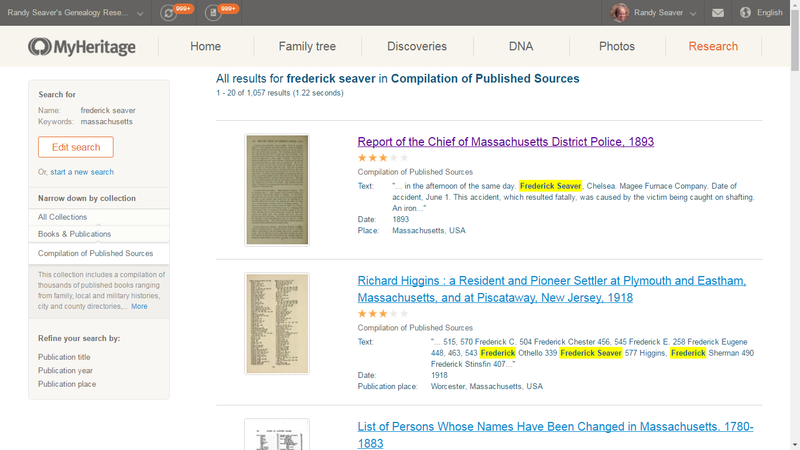 I was looking for Seaver articles in the "Compilation of Published Sources" on MyHeritage today, and put my father's name ("frederick" and "seaver") in the search field, and made the search "Exact". fractured and one leg broken. He received also internal injuries. occurred at this establishment for thirty years. District Police of Massachusetts, Report of the Chief of Massachusetts District Police, 1893 (Boston, Mass. : Wright & Potter Printing Co., 1894), page 440, Frederick Seaver article; accessed on MyHeritage (http://www.myheritage.com) in "Compilation of Published Sources" collection. My next issue was "Who is this Frederick Seaver?" I knew that he died 1 June 1893 in Chelsea from this article in the book. I checked my RootsMagic database for Fred* S*v*r* folks and found none that fit the known facts. How old was he? Who were his parents? 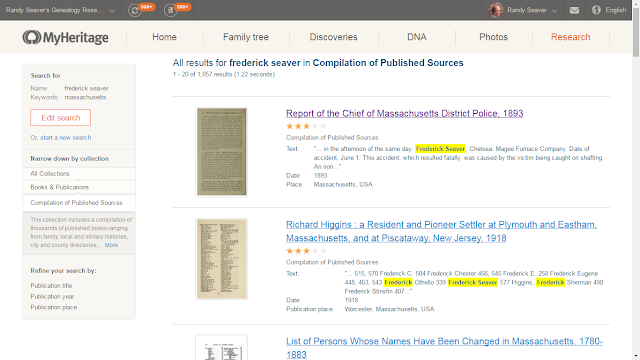 "Massachusetts Vital Records, 1841-1915," indexed database and digital images, New England Historic Genealogical Society, American Ancestors (http://www.AmericanAncestors.org : accessed 24 January 2017), Deaths, Volume 438, Page 541, Chelsea, 1893, Fred J. Sieber entry. So he's not one of the Massachusetts Seaver lines, but is the son of a Sieber German immigrant. Oh well, he was a Seaver when he made the news in 1893. Now I wondered if there was a newspaper article about him. I found an article dated 2 June 1893 in the Boston Herald newspaper on GenealogyBank, which provides much the same information as the article above for Frederick Seaver.